I was strolling through the park one day, in the merry merry month of May. Well, not really, but there’s a Drobo 5D in my house that has years and years worth of pictures on it. Why did I get a Drobo 5D anyway? I was pleased with my Drobo 5S and we needed another disk array for primarily picture backup. I suggested it since I was almost regularly recovering failed hard drives with pictures on them. I wanted something with more protection, and easier to manage. After some googling around, it seemed that there were a number of other Drobo (and other disk) users that encountered the same message. 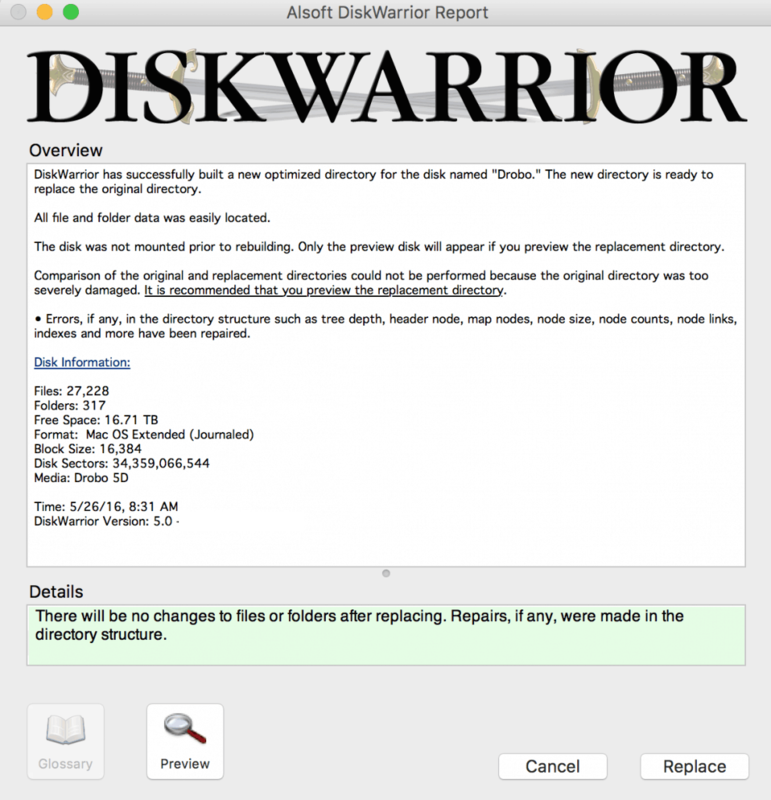 DiskWarrior was brought up a number of times as a quick and easy solution. This post is not sponsored by DiskWarrior in any way, the product just worked quickly and easily. After purchasing and installing DiskWarrior (Note: it wouldn’t let me us a gmail address at checkout), I was relieved when it found the Drobo. I clicked Rebuild, and in a matter of minutes, DiskWarrior showed me it was able to easily locate my files and folders. First I previewed the changes, to make sure I wasn’t about to wipe my Drobo or do something else equally horrible to it. I was presented with the first view of my Drobo, which was an unreadable blob of storage and the second view, which listed all of the directories on my Drobo. Whew! I confidently clicked replace, and within another minute or two the Drobo was once again mounted to the iMac. Unfortunately, Tech Support Engineer Google says this is a somewhat common occurrence. While there may have been command line methods for me to try to recover the file system, I was nervous as it was since I was messing with years and years worth of data. 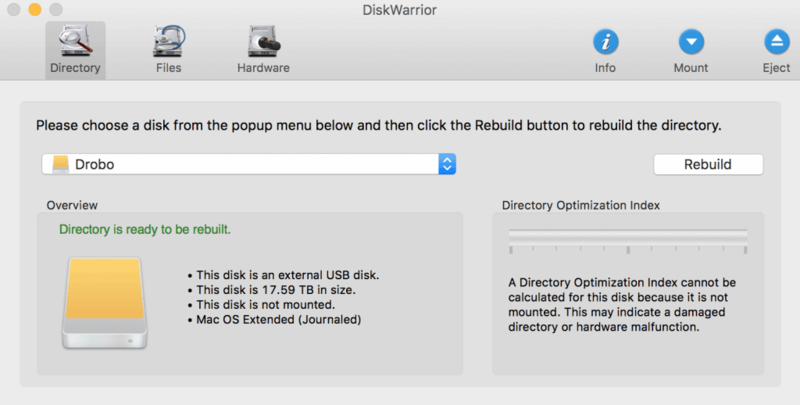 DiskWarrior provided a quick and easy solution, and while it did cost $119.95, it was a great tool that will probably come in handy the next time I have an issue with a disk. Hopefully the Drobo5D does not experience this issue in the future, however I am still not sure what caused it in the first place.